Traditionally, the father in the family was the disciplinarian. “Wait ‘til your father gets home” was said as a matter of fact and as a threat. Times have changed and fathers are generally more involved in the parenting of and playing with the children, not just the discipline. We talked a lot about parenting in Bible study this past Wednesday. People remembered their parents’ stern discipline, and even their own parenting, in which spanking was common. I remember getting one good spanking when I was a child--and boy did I deserve it--but I think it hurt my Dad as much as it hurt me. And so there were no more spankings after that. From the spanking to the strike outs, two things were clear: Expectations and Consequences. What kind of parent do you think God is? In the OT, we might say a stern parent, a punishing parent, a parent to be feared. And there is truth to that. And yet, both readings from Old Testament today provide insight into God’s parenting that may be surprising. Thou shall have no other gods. Thou shall not take the Lord’s name in vain. Thou shall not murder. Thou shall not commit adultery. Thou shall not steal. Thou shall not lie. Clear expectations: God is very clear about what is expected of his children and how they should live. But, what are the consequences of breaking the law? “Why?” The Israelites might have asked. But let’s take a closer look: The reading begins with these words God speaks, “I am the Lord your God, who brought you out of the land of Egypt, out of the house of slavery.” In other words, I am the one who created you and rescued you and led you to freedom, so you can trust that I want what is best for you. The law is the law--God’s expectations are crystal clear. And not keeping the law is sin. Sin is separation from God. That’s the consequence. If the people do not keep the law, they are on their own, without the protection and provision and promise of relationship with God. God does not want to be separated from the children he loves. So, God gave the law. When it comes down to it, the 10 commandments are the law of love. In the Psalm, we read about the law, not the content of it, but why God’s people should obey it. Instead, it is positive with a promised reward of keeping the law. The law of the Lord is perfect, reviving the soul; The commandment of the Lord is clear, enlightening the eyes; The ordinances of the Lord are true and righteous, more to be desired are they than gold; in keeping them there is great reward. In Psalm 19, we find a balance between clear expectations and positive consequences. Rather than threatening those who do not keep the law, the Psalmist takes a positive approach and gives the why--because it will benefit you. Clear consequences: Your life will be better. I had another sermon written, but then a news story broke. Last night, the Spirit led me to finish the sermon differently. So, let’s trust the Spirit to lead us in a different direction. There has been a lot of talk about the law in the news this week, particularly the immigration law. The immigration law is complex--detailing who can enter the U.S. and how they can become citizens--or not. The law is the law, but government policies have allowed various interpretations of the law, e.g. to allow people who are persecuted in their own countries to come here seeking assylyum and protection from harm. Border crossings have traditionally been treated as civil offenses with families being detained together. The current justice department has taken a hard stance on immigration and has enforced the law to extremes, even taking children out of the hands of their parents, putting the adults in jail to await sentencing and sending the children to detention centers. 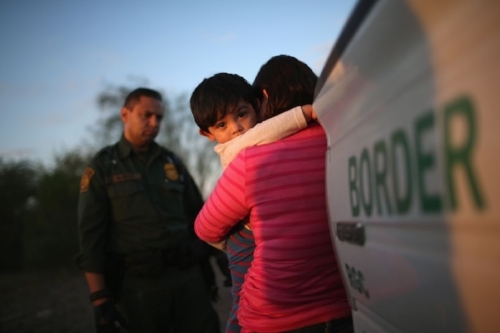 While some claim these cases are outliers, it has been reported that in the last 2 months, up to 2,000 children have been taken from their parents, leaving the children screaming and inconsolable. Psychologists say that these children will be damaged and likely never fully recover from the trauma. How can we as a country defend this seemingly inhumane policy that runs counter to human rights? This week, to defend his policy, the Attorney General Jeff Sessions quoted Scripture, Romans 13: Let every person be subject to the governing authorities; for there is no authority except from God, and those authorities that exist have been instituted by God. 2)Therefore whoever resists authority resists what God has appointed, and those who resist will incur judgment. 3) Then do what is good, and you will receive its approval; 4) for it is God’s servant for your good. But if you do what is wrong, you should be afraid, for the authority does not bear the sword in vain! It is the servant of God to execute wrath on the wrongdoer. These 4 verses taken out of context support punishment by authorities, ordained by God, but if we read on, we put these verses in context. We learn that the issue is not an immigration law that punishes children, but taxes--7) Pay to all what is due them—taxes to whom taxes are due, revenue to whom revenue is due, respect to whom respect is due, honor to whom honor is due. And the passage goes on to say that ultimately the law is about love. 8) Owe no one anything, except to love one another; for the one who loves another has fulfilled the law. 9)The commandments, “You shall not commit adultery; You shall not murder; You shall not steal; You shall not covet”; and any other commandment, are summed up in this word, “Love your neighbor as yourself.” 10) Love does no wrong to a neighbor; therefore, love is the fulfilling of the law. I applaud Sessions as a Christian for looking to the Bible for guidance on these tough issues. I just wish he would have finished reading the chapter of Romans, because if he had, he would have read that God’s law is one of love--to love our neighbor as ourselves, to do no wrong to a neighbor. God gave us the law so that we would not sin, because sin is separation from God. And God did not want to be separated from children he loves. How ironic that the U.S. law is being used to literally do just that, to separate children from their parents. Please hear me when I say this is not political, it is not a partisan issue. It is a human rights issue. People from both political parties, people from churches across the spectrum of conservative to liberal are all speaking out against this cruel and unusual punishment. One conservative commentator said that there is nothing conservative about children being ripped from their parents’ arms. I urge you to do the same. Read Romans 13 for yourself, talk about it, pray about it, and then do something. Call your senator or representative. Write to the Attorney General. Urge them to reconsider taking children from their parents. Encourage them to find another way, a better way, a way that allows the law to be enforced, but out of love for our neighbors. I am not saying it will be easy. But more often than not, the right way is the hard way. And some things, even though they are hard, are worth doing right. In Jesus Christ, God gives us a clear positive reward: salvation. Out of thanksgiving, let us walk in the light, fulfill the law by loving God and our neighbor as ourselves. People killing. People dying. Children hurt and hear them crying. Can you practice what you preach? Can you turn the other cheek? Father, Father, Father, help us, we need some guidance from above. People got me questioning, where is the love? May we be the love the world today so desperately needs.